For a limited time Crested Butte Mountain Resort is offering a complimentary “Gay Card” party pass to guests booking a minimum of four-nights accommodations to “Butte 11: Matthew Shepard Foundation Gay Ski Week,” which takes place March 19 - 26, 2011 in Crested Butte. The Gay Card is the all access party pass to Matthew Shepard Foundation Gay Ski Week and provides admission to all official events throughout gay ski week. Reservations may be booked online at http://www.matthewshepardgayskiweek.com or through a special ski week reservation line at 1-800-334-4862. This special offer is good through February 28, 2011. Butte 11: Matthew Shepard Foundation Gay Ski Week will boast a full schedule of events in addition to renowned skiing. For a limited time Crested Butte Mountain Resort is offering a complimentary “Gay Card” party pass to guests booking a minimum of four-nights accommodations to “Butte 11: Matthew Shepard Foundation Gay Ski Week,” which takes place March 19 - 26, 2011 in Crested Butte. The Gay Card is the all access party pass to Matthew Shepard Foundation Gay Ski Week (“MSFGSW”) and provides admission to all official events throughout gay ski week. Reservations may be booked online at http://www.matthewshepardgayskiweek.com or through a special ski week reservation line at 1-800-334-4862. This special offer is good through February 28, 2011. 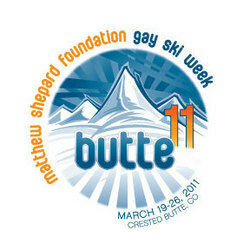 Butte 11: Matthew Shepard Foundation Gay Ski Week will boast a full schedule of events in addition to renowned skiing. Ski week parties include Martini Monday at the Dogwood, the Shoot the Butte Pub Crawl, the Splash Pool Party, the Purple Party and Crested Butte’s popular Soul Train Dance Party. MSFGSW is being produced by StraightOut Media & Marketing, well known for its top-ranked Telluride Gay Ski Week, and co-developed with CBMR and the Matthew Shepard Foundation, one of the leading GLBT education, advocacy and awareness organizations in the United States. StraightOut Media & Marketing ("SOMM") is a Dallas-based company with more than 40 years of combined agency and client side experience; including, national and global public relations, media relations, corporate communications, branding and strategic marketing. SOMM brings demonstrated expertise in a range of markets and industries from retail, non-profit organizations, diversity marketing, restaurants, hotels and destination marketing to mobile communications, broadcast media, print media, motion pictures, financial communications and residential and multi-family housing. In addition to solid mainstream experience, SOMM has developed a strong reputation as one of the very few “go to” agencies when clients are looking for expertise in marketing to the GLBT community. Nestled in the heart of Colorado’s Rocky Mountains, Crested Butte is committed to preserving the pristine landscape and mountain lifestyle. With vibrant Victorian store-fronts and expressive local characters, the small historic town remains true to its heritage and radiates an unparalleled welcoming and inviting spirit that celebrates a simpler life and time. Thanks to a widely diverse landscape, whether beginner or burgeoning national champion, outdoor enthusiasts of all levels will find a new challenge with each visit. From world-class mountain biking, to legendary skiing and snowboarding, to a secluded fly-fishing experience, Crested Butte is one of Colorado’s best-kept secrets. This season, Crested Butte celebrates 50 years of skiing and riding with a year-long celebration, Crested Butte-style. http://www.skicb.com.